The other day on Facebook I asked your opinion on “classic casseroles”. The response was almost unanimous—you love them, but would like to see versions made without as many canned ingredients or “cream of” soups. I’m all about that idea, so the first casserole I decided to tackle was this Beef & Mushroom Country Casserole. 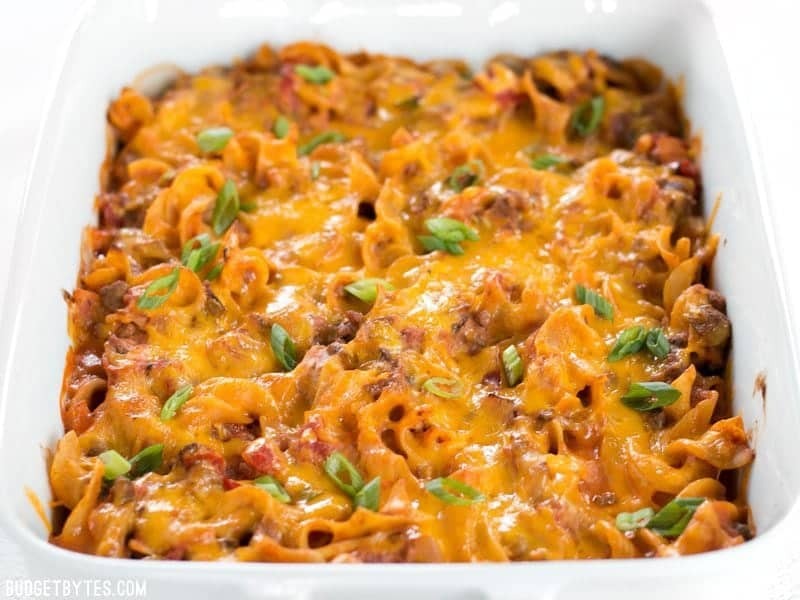 If you pop “country casserole” into Google or Pinterest you’ll find 100 different versions (here’s one from PlainChicken.com and another from SixSistersStuff.com). 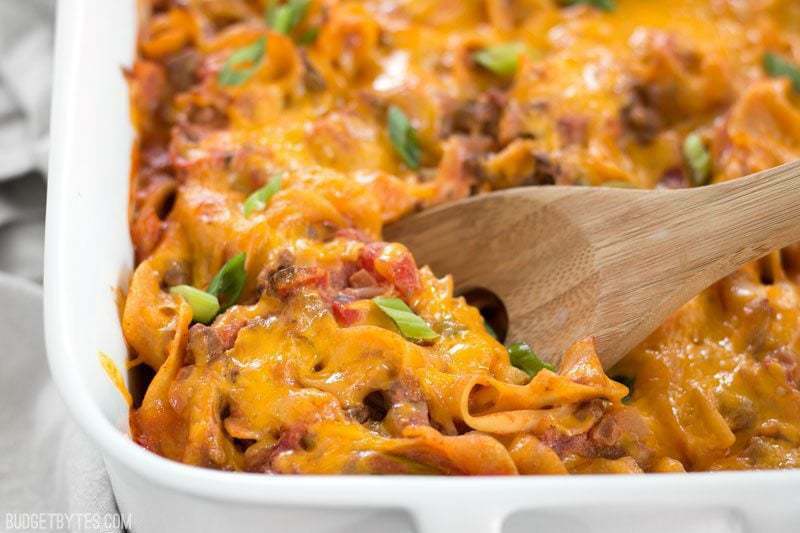 Sometimes it’s called Amish Country Casserole, sometimes Beef and Noodle Casserole, sometimes just Country Casserole, but they all have one thing in common—they’re a creamy, beefy, noodley delight! 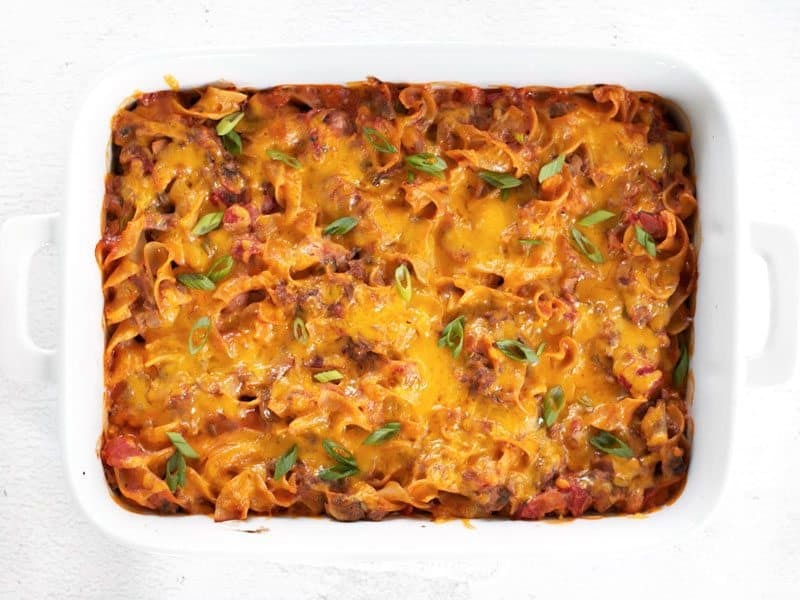 Most versions of this classic casserole include a can of tomato soup, a can of cream of mushroom soup, some sort of cheese, and usually no vegetables. So, I knew there was definitely room for improvement. As with most casseroles, this guy is pretty filling and caloric. I split mine into six servings. The servings may look on the small side volume-wise, but it made me quite full. If you need more volume in your meal to make your “eyes” full, I suggest adding a simple side salad or using 12oz. pasta instead of eight. 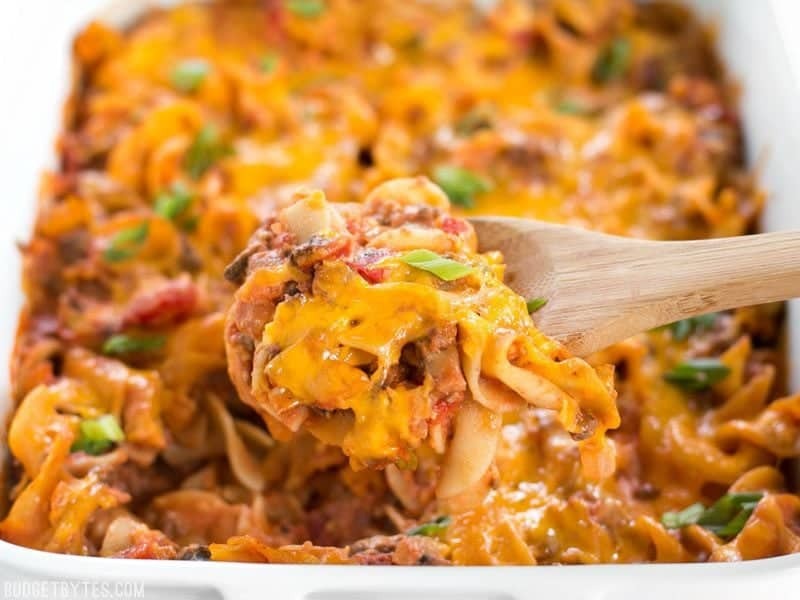 Beef & Mushroom Country Casserole is a filling and flavorful hot meal that the whole family will love, and with NO cream of soups! Cook the noodles according to the package directions, but until slightly less done. The noodles will further cook while the casserole bakes. 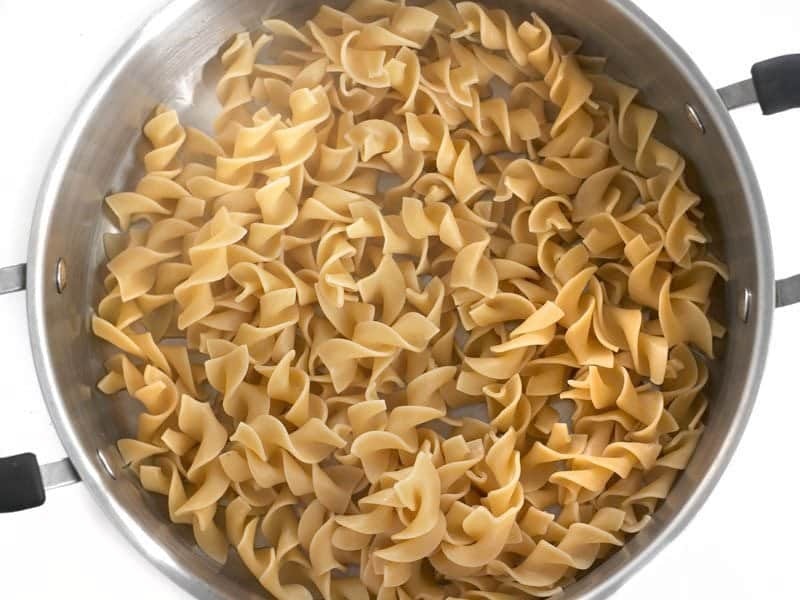 Once cooked, drain the noodles and set it aside. While the noodles are cooking, finely dice the onion and slice the mushrooms. 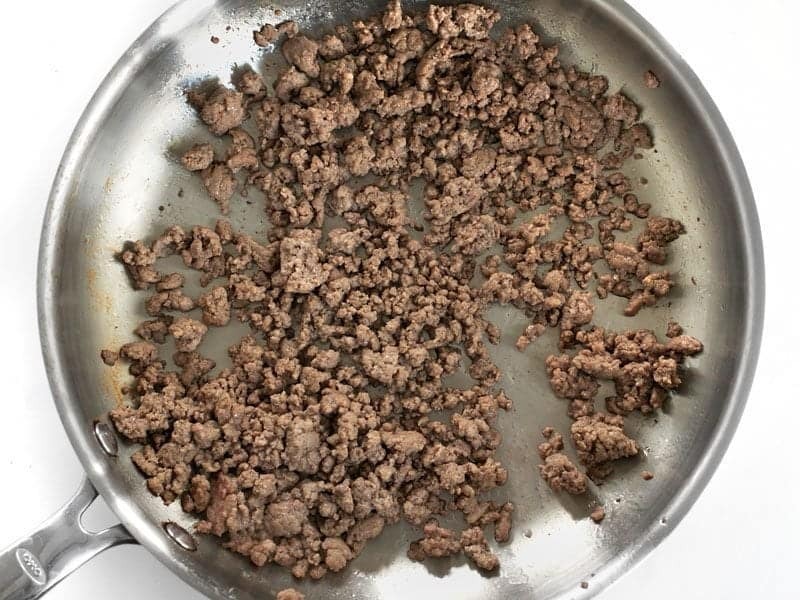 Add the cooking oil and ground beef to a large skillet. Cook over medium heat until the beef is fully browned. If using a higher fat content beef, drain off the excess fat before continuing. 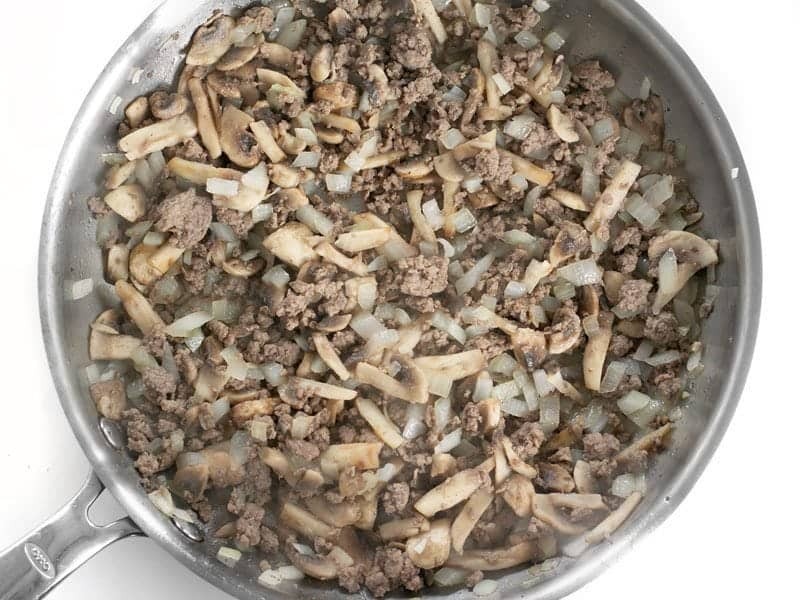 Add the diced onion, sliced mushrooms, garlic powder, salt, and some freshly cracked pepper to the skillet. Continue to sauté over medium heat until the mushrooms are soft and the onions are transparent. Add the tomato sauce and Worcestershire sauce to the beef and mushroom mixture. Stir to combine, then simmer for a few minutes, or until it thickens slightly. Preheat the oven to 350 degrees. Return the drained noodles to the pot they were boiled in (heat turned off) and add the beef and tomato mixture, diced tomatoes (drained), sour cream, half of the shredded cheddar, and half of the green onions. Stir to combine and then transfer the mixture to a 9x13 inch casserole dish. 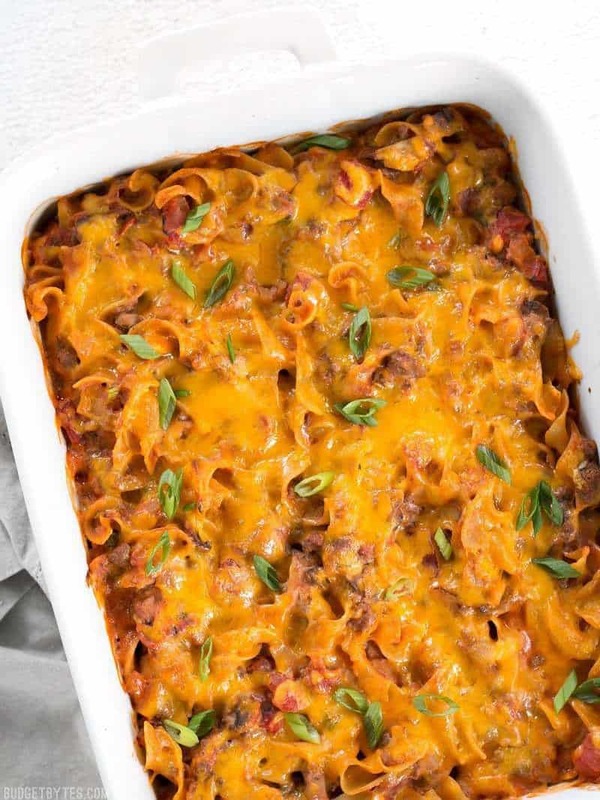 Top the casserole with the remaining shredded cheese, then bake in the preheated oven for 30 minutes, or until it is bubbling around the edges and the top is starting to brown just slightly. After removing from the oven, sprinkle the remaining green onions over top. Cook 8oz. extra-wide egg noodles according to the package directions, but leave them slightly underdone (cook about 2 minutes less than directed). The noodles will finish cooking while the casserole bakes. While the noodles are cooking, dice one onion and slice 8oz. mushrooms. Add 1 Tbsp cooking oil to a large skillet along with 1/2 lb. ground beef. Cook the beef over medium heat until the meat is fully browned. 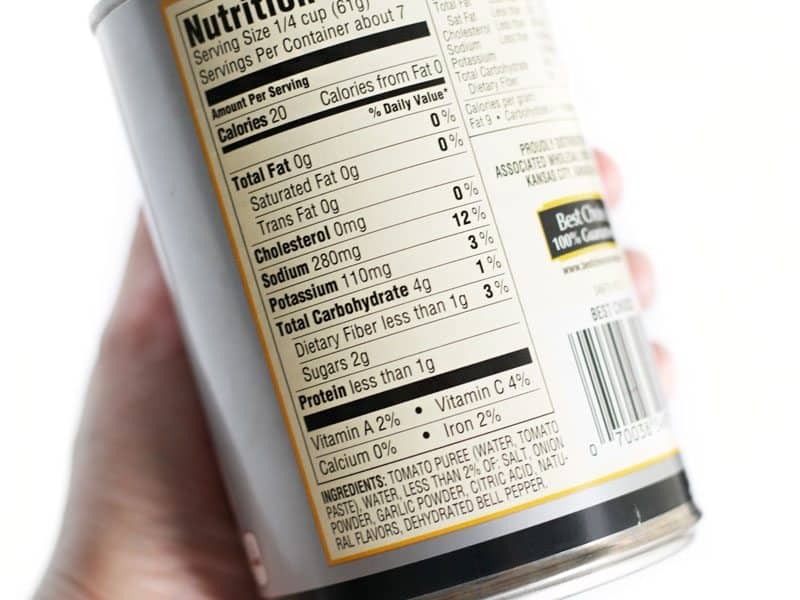 If using a higher percent fat beef, drain the excess fat before continuing. Add the diced onion, sliced mushrooms, 1/4 tsp garlic powder, about 1/4 tsp salt, and some freshly cracked pepper to the skillet. Continue to sauté until the mushrooms are soft and the onions are transparent. Add one 15oz. can tomato sauce and 1/2 Tbsp Worcestershire sauce. Stir to combine, then let simmer over medium heat for a few minutes or just until it thickens a touch. 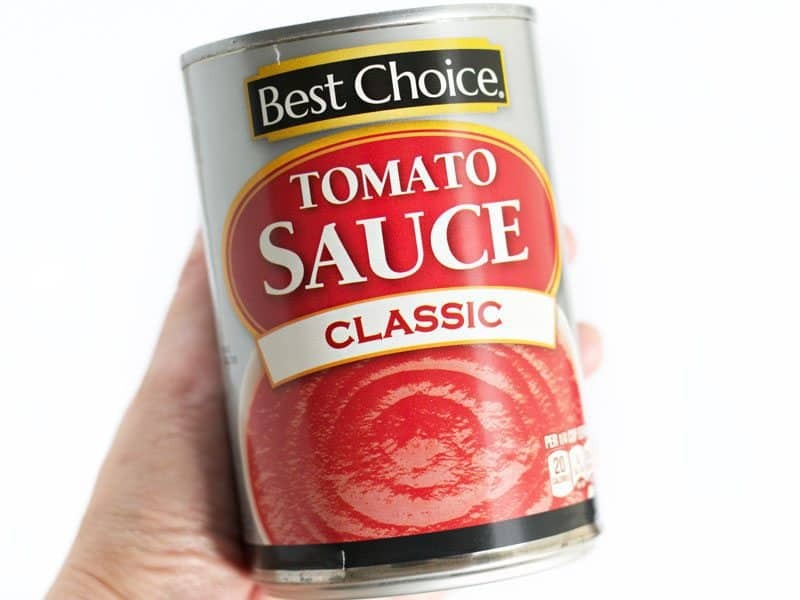 My international readers always ask what “tomato sauce” is, so let me show you… :) It’s basically puréed tomatoes, with just a little salt and seasoning (onion, garlic, etc.). It’s not sweet like ketchup or tomato soup. I think the closest product would be passata, but you might need to add a little more salt. Here’s the back so you can see the ingredients. It’s mostly just tomato and has a LOT less sugar than canned tomato soup. Anyway, back to the recipe… Preheat your oven to 350ºF. 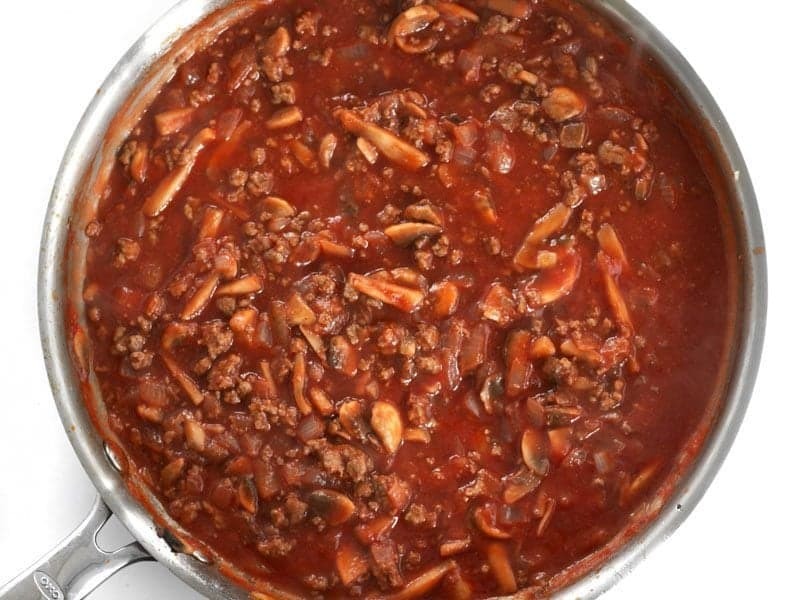 Return the drained noodles to the pot that they cooked in (assuming it’s big enough to be used as a mixing vessel) and add the beefy mushroom tomato mixture, one 15oz. can of fire roasted diced tomatoes (drained), 8oz. sour cream, 2 sliced green onions, and 4oz. shredded cheddar cheese (the rest of the cheese and onions will be used to top the casserole). Stir everything to combine. 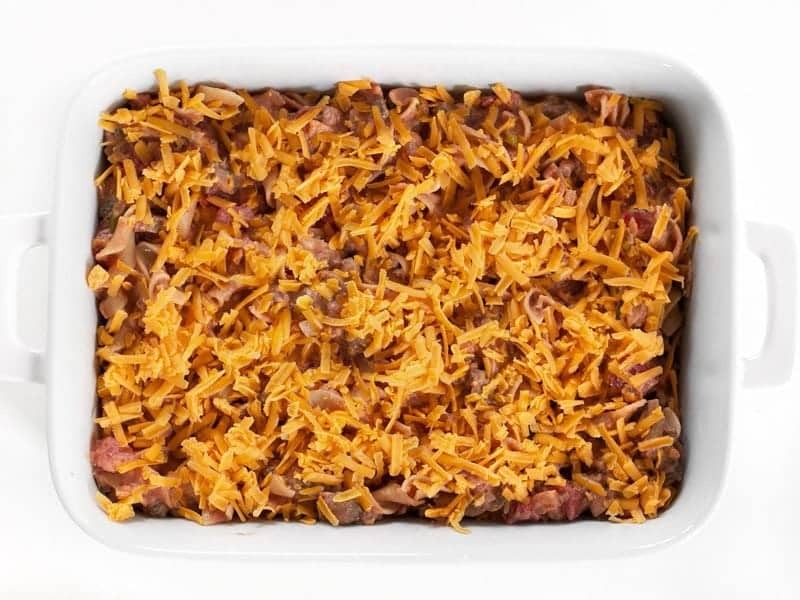 Transfer the mixed casserole ingredients to a 9×13 inch casserole dish. Top with the remaining 4oz. shredded cheddar. Bake in the preheated oven for 30 minutes, or until it’s very bubbly around the edges and just a little brown on top. One could use Greek yogurt instead of sour cream too. Which would add some health benefits. I made a pasta casserole with it once and it was great. I made this a few weeks ago and it was AMAZING. I used about 1lb of meat instead of 1/2lb because my beef was already open and I wanted to use it up, and the ratios seemed perfect. The casserole was very easy to make, as well. Let me tell you, leftovers did NOT last long. This recipe will be a staple in my house. Great week night dinner go-to! I was able to get all the ingredients at my local Aldi’s and had plenty for leftovers to eat for lunch at work during the week! 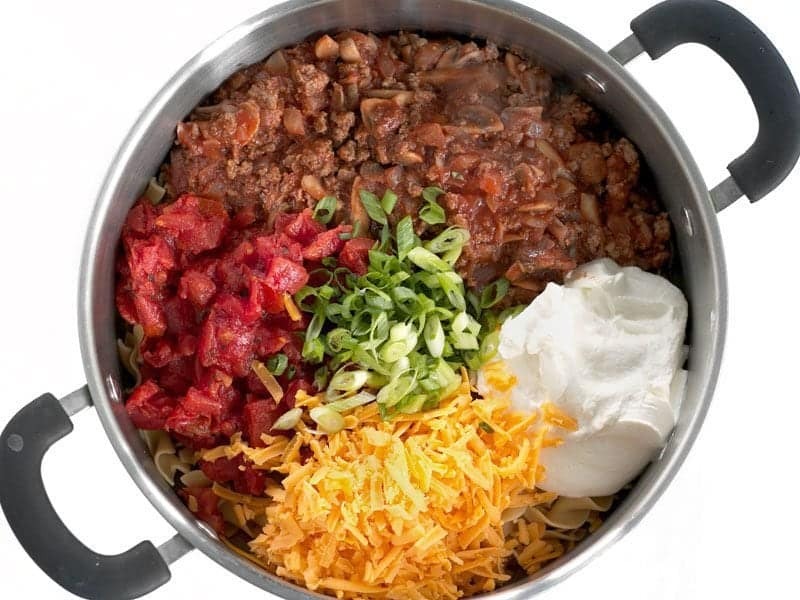 Great alternative to hamburger helper type box meals and I love how customizeable it is based on whatever ingredients/seasonings you have on hand. Thanks for the recipe! Great recipe! I added grated carrot and zucchini. Next time I’ll add bacon and peas. Hi Beth, looking forward to trying this sometime! Only thing I’ll mention is one of the pictures in the photo instructions is missing – the mushrooms are missing in action. Hey, first of all I love your recipes and your website. I only just started to cook my own stuff after moving out (again) but it is a real life saver and am really enjoying finding my culinary routes with your great dishes. In one of the steps you mention pasta, are you referencing the noodles? I am just a little confused because I didn’t see pasta listed in the ingredients at the top. Many thanks & keep up the great work!